A drone captured this image of Somerville High School. 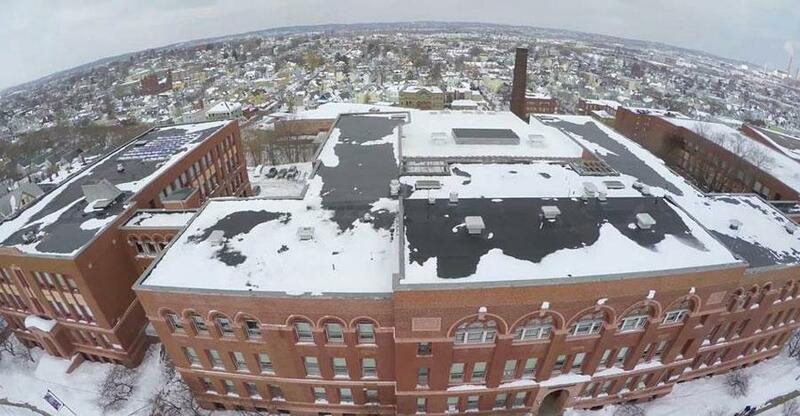 There’s something other than snow flying through the air in Somerville: drones. The city said Thursday that officials hired Above Summit, an aerial cinematography and multimedia company, to survey municipal buildings for excessive snow buildup using the flying robots. “They hover the drones right above the city building roofs, and then send us video that they capture as it comes in, almost on a real-time basis,” said Daniel Hadley, chief of staff to Mayor Joseph Curtatone. Somerville workers have spent the last two weeks atop city structures, clearing away snow that has accumulated in the successive winter storms. Snow piles on school buildings got so high that officials worried about collapse, prompting the mayor to keep students home for a week. Jovan Tanasijevic, co-founder of Above Summit, said they covered 10 buildings on their first day. He said conditions were windy for the drone they used, but they got the work done. “We will probably go out tomorrow for one more run,” he said. Tanasijevic said the operation was within the bounds of Federal Aviation Administration regulations. Somerville paid Above Summit $1,500 for the work. Hadley said officials came up with the drone idea during a meeting of city agencies Thursday. They figured it would be quicker than sending inspectors to check them one-by-one.